The long history of shipwrecks off North Ronaldsay comes about from its position. To sail between the Atlantic and the North Sea, options are limited. The English Channel was risky in times of war, and the Pentland Firth was dangerous. That left the 25-mile gap between North Ronaldsay and Fair Isle to the north, to meet the growing demand of 18th-century colonial trade. But for ships making the passage, North Ronaldsay lies low in the water, and is easy to miss amongst fog or sea-spray, while strong tides flow around it. Offshore there are several particularly dangerous areas. To the north is Seal Skerry, low and flat with a wide area concealed by high tide; and just below the water on the east side is the Reefdyke, so close to the surface that fishermen can at times touch the shallowest parts with an oar. But on a dark night it lies unseen, waiting to tear the bottom out of a ship that crosses its path. In November 1740 the Swedish merchantman Svecia hit that deadly line of rock in daylight, and lodged fast. The crew rigged up a large raft, to make for land, but it was caught in a tide-rip and broke up. The only survivors from more than a hundred aboard were thirteen men who reached the land on a large piece of the ship’s quarterdeck. She was a Swedish East India Company vessel, bound from Bengal for her home port of Gothenberg, with silks and cottons, and also dye wood – hard red sandalwood from the coast of Coromandel. The story of the Svecia and much else of the island’s history is recorded in photographs and documents in an archive on view in the New Kirk. The scale of the loss led to calls for action, and in particular for better charts. One of the greatest mathematicians of the time, Colin Maclaurin of Edinburgh University, was asked to help; and he recommended a former student, Murdoch Mackenzie, who was teaching at Kirkwall Grammar School. The maps produced by Murdoch Mackenzie were outstanding, ahead of anything else in the world, and he became Surveyor to the Admiralty and a fellow of the Royal Society. But he warned that for North Ronaldsay, even the best charts were not enough; a light was also needed. 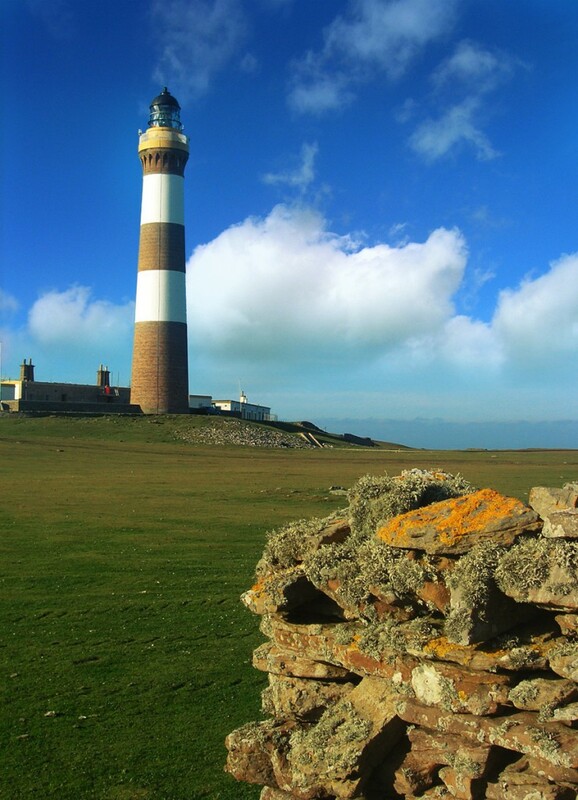 An Act of Parliament on 1786 established the Commissioners of Northern Lighthouses, with four lights to construct, North Ronaldsay among them. They gave the work to Thomas Smith of Edinburgh, who had developed lamps with reflectors for a cleaner and more powerful light for the streets of the New Town. Smith, a widower, married in 1787 a widow with a son, and found that the boy, Robert Stevenson, had a great talent for craftsmanship, and in time took him on as an apprentice. 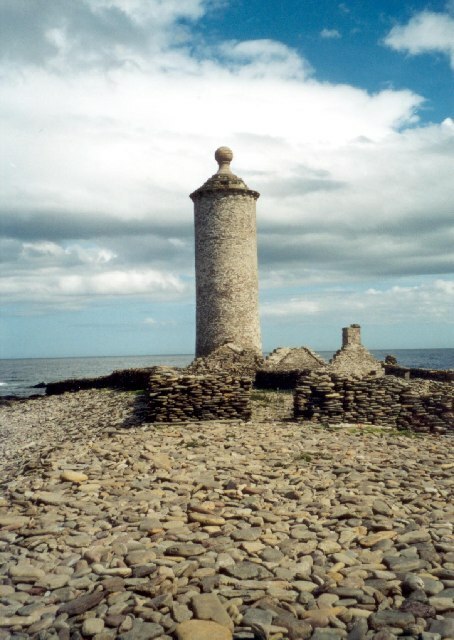 Meanwhile the site of Dennis Ness in North Ronaldsay had been chosen for the new light, and the land given free of charge by the laird, James Traill; and James Sinclair and John White, masons in Kirkwall had been contracted to build a round tower. But it was too low: it looked like the friendly light of a ship in safe waters, instead of a warning of danger; and in 1809 the lamp was transferred to a beacon that had been built in Sanday at The Start, in exchange for the round stone ball we see today on top of the old lighthouse, the Old Beacon. The problem in North Ronaldsay was eventually solved by going to higher ground above the Old Beacon to construct the tallest land-based lighthouse in the British Isles. 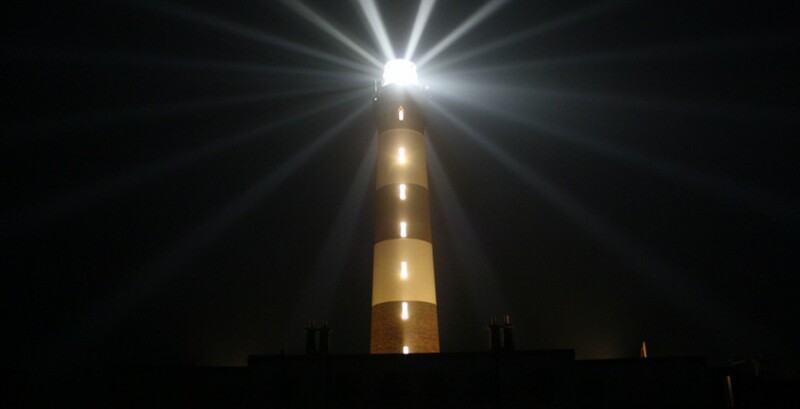 Just over forty-two metres high, it was designed by Robert Stevenson’s son Alan, the builder of Skerryvore. The lamp, lit in 1854, was so effective that it is still there today. It uses a Fresnel lens, a design involving a series of thin and perfectly polished rings of crystal glass which focuses a powerful beam; the North Ronaldsay light can be seen from eighteen miles away in clear weather. In 1998 the light became automated, and the redundant support buildings made available to the community. Two of the lightkeepers’ cottages are now holiday accommodation, with the third an interpretation centre and café, while the workshop houses the woolmill which spins the yarn from the island’s native sheep.